I help improve organizational performance through targeted interventions and coaching based on fundamental lean principles. The level and type of engagement depends on whether the client seeks an immediate solution to a business problem, or the development of broader internal skills and capabilities. 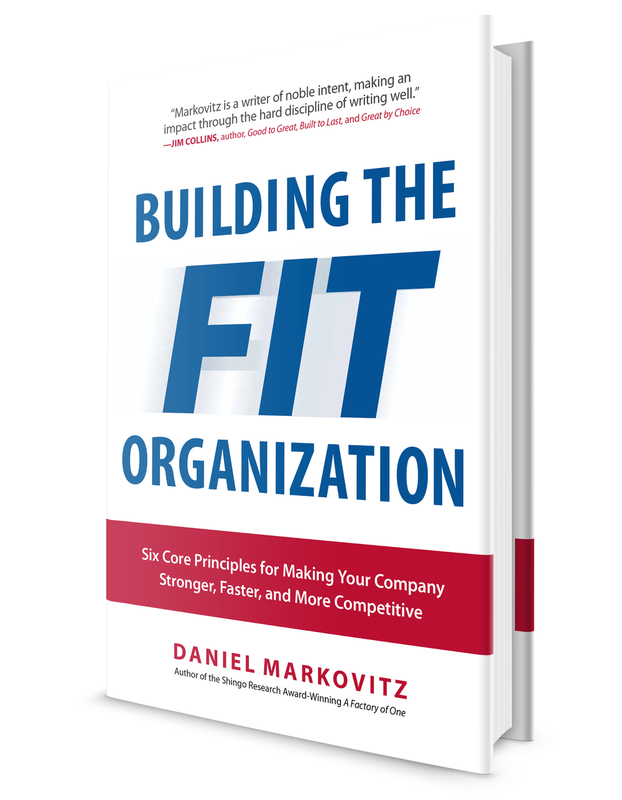 THE FIT ORGANIZATION: This presentation, based on my new book, Building the Fit Organization, presents the six core principles that will make any organization stronger, faster, and more competitive. By reframing continuous improvement as a journey towards organizational fitness, it provides a non-alienating cognitive and cultural on-ramp for the audience. A FACTORY OF ONE: This keynote draws on the concepts from my Shingo Research Award-winning book of the same title. Attendees learn how to apply lean manufacturing principles to individual work so that they can get more value-added works done with less effort. FROM FIRE FIGHTING TO CONTINUOUS IMPROVEMENT: This interactive session introduces the scientific method of problem solving that lies at the core of any sustainable commitment to continuous improvement. STRUCTURED PROBLEM SOLVING: This workshop guides participants through the process of creating of an in-depth, single-page understanding of a problem, including context, root cause analysis, countermeasures, implementation plan, and follow up. PERSONAL LEAN: If you want to lead lean, you've got to live lean. This workshop blends classic time management principles with lean manufacturing techniques and the latest psychological insights to show attendees how to create more value and reduce waste in their workflows. VALUE STREAM MAPPING: Value stream mapping is a critically important skill for analyzing and understanding complex (and invisible) office processes. In this workshop, participants will learn fundamental mapping techniques that they can immediately use at their jobs. LEAN FUNDAMENTALS: What does "lean" mean, and where did it come from? This is a short introduction to the history of lean, its core principles, and the best way to approach it in your organization. Sign up for weekly (or so) emails. Sure, I'll Join the Party! A3 Thinking: This guide provides an introduction to the fundamentals of "A3" thinking, an elegant and structured approach to root cause problem solving. This Infopack explains what an A3 is, why you'd want to use it, and highlights common mistakes. Value Stream Mapping: A short primer on the basics of value stream mapping. This Infopack identifies the key components of a value stream map, and suggests how to introduce it to your organization. Bridging the Gap: Sometimes the basics get lost in the heated discussions over the various ways to develop strategy. This short Infopack presents four key principles that you don't want to forget, irrespective of your preferred approach to making strategy. Fit Organization: Is your organization fit or flabby? Use this self-assessment to identify where you're doing well and where you need some work in the six critical areas for operational excellence. Organizational Efficiency: What people commonly perceive as time management challenges are actually symptoms of underlying problems in organizational efficiency. This assessment will help you identify where the root cause lies. Individual Lean: Your organization may be well on its lean journey, but what about your own work habits? You might be surprised at how much waste in all its myriad forms is hidden in your own work. Take this assessment to learn where -- and how -- you can improve the way you work. If you liked this stuff, sign up for weekly (or so) emails. "Dan Markovitz brings a thoughtful and supremely practical perspective to the fundamental scarcity faced by us all: time." "Dan is one of today's leading voices revealing the role of skill development in organizations, and how practice is a vital ingredient for acquiring new skills, mindsets, and making change really happen." I founded Markovitz Consulting to help organizations become faster, stronger, and more agile through the application of lean principles to knowledge work. I've worked with non-profit and governmental organizations such as the New York City Department of Health, Planned Parenthood, and Memorial Sloan-Kettering Cancer Center, as well as a diverse roster of corporations such Starkey Technologies, W.L. Gore & Associates, Abbott Vascular, Clif Bar, Hydro Flask, and CamelBak. I've keynoted conferences and delivered seminars at the Lean Enterprise Academy Summit (UK), the Lean Island Conference (Iceland), the Lean Transformation Summit (US), the Rome Confluence Conference, the Outdoor Industry Association Rendezvous, the Printing Industry Association Continuous Improvement Conference, and numerous Association of Manufacturing Excellence events. I'm a faculty member at the Lean Enterprise Institute and teach regularly at the Stanford University Continuing Studies Program. I also lecture at the Ohio State University’s Fisher School of Business. My first book, A Factory of One, was honored with a Shingo Research Award in 2013. I've also published articles in the Harvard Business Review blog, Quality Progress, Industry Week, Reliable Plant, and Management Services Journal, among other magazines. I lived in Japan for four years and am fluent in Japanese. (Sadly, I knew nothing about lean at this time, and missed the opportunity to visit, study, and learn from Toyota while I was near the mothership.) I received a BA from Wesleyan University and an MBA from the Stanford Graduate School of Business. Signup for weekly (or so) emails.